The Kalanchoe sexangularis showing it's brilliant winter colours. Have you ever wondered why succulents with the same name can look so different? Take for instance Kalanchoes from the Crassulaceae family. Kalanchoe sexangularis (see pic) is a good example. 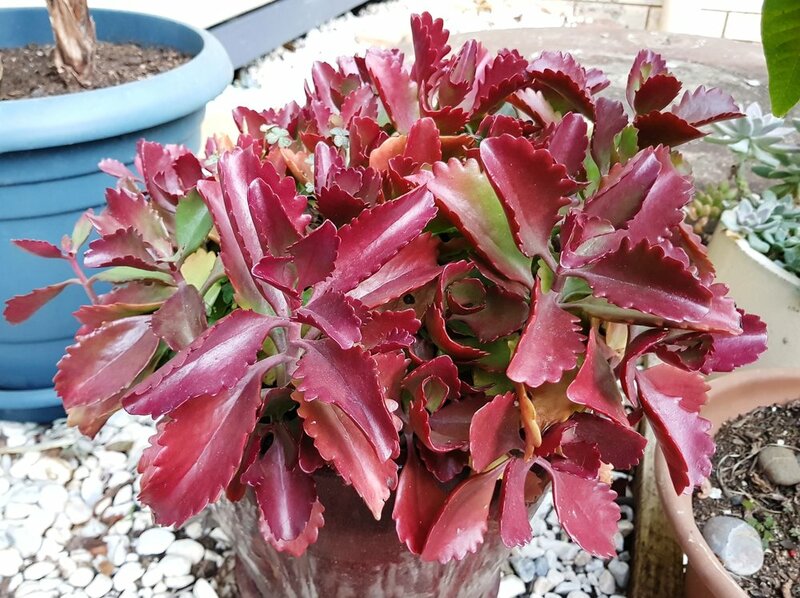 Common name of this succulent is six angled Kalanchoe and it makes a great addition to your garden. During the summer months this succulent is green with maybe a hint of red on the tips. However, during winter the colour change is quite remarkable and it turns into a real showstopper. The red emerges, and becomes the prime colour, turning the plant into an absolute show piece. So if you see pictures with succulents that have the same name, and yet look very different, this can be one reason why. Another good example is Echeveria Prolifera. This little beauty is greyish/blue in the summer months but come the colder weather it changes. 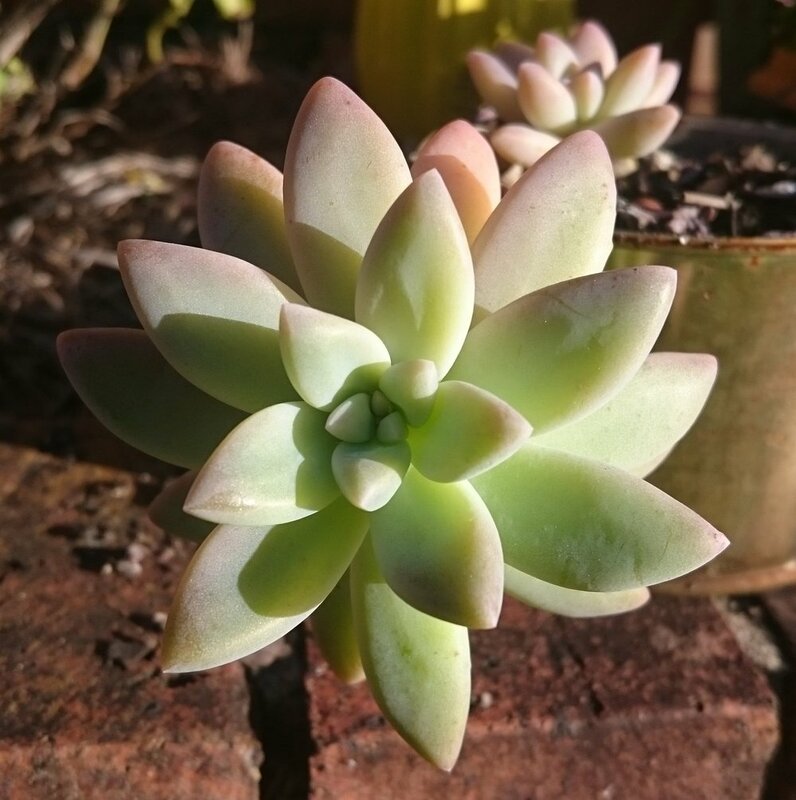 The little rosettes are a greenish colour in the centre, and the outer tips become pink making the plant look very different to how it appears in summer. This little guy below, from a friend's place, has been kept both outside in full sun and inside with almost no sun. You can see it looks like two completely different plants. Outside in full sun, getting water whenever it rains. Inside with almost no sun, and very little water. From my experience the position you place your succulent in will make a big difference. Have you ever purchased a plant, brought it home and then watched it change in appearance. This can be as simple as where you have positioned it and how much water the plant receives. It is just the plant adjusting to its new environment. They change colour, they can become spindly and they can rot if they are not cared for properly. Yes, succulents are very easy plants to care for if you position them correctly, and if you do not over-water them. So when you buy a succulent don't worry if it looks a little bit different. This is quite common, it can be as simple as the seasonal changes or the amount of sunshine the plant has been receiving. It’s all about experience, and I can tell you it’s a lot of fun watching the colours change.